After the successful release of four varieties of Bt eggplant in 2013, adoption rate of the technology among Bangladeshi farmers has increased steadfastly – from 20 farmers in 2013-14 to over 6500 towards the end of 2017. In the light of accelerated adoption by farmers through strong support and collaboration from BARI and Ministry of Agriculture, sustainability of the technology has become a priority for boosting agricultural productivity in the country. As a part of the post-commercialization stewardship efforts through capacity building initiatives under the aegis of Feed the Future South Asia Eggplant Improvement Partnership (FtFBP), a team constituting of trainers from Mahyco – Dr. Pankaj Bihani, Mr. Amalan Murugesan, Mr. Ratnapal Gandhi, and Dr. Smitha Kurup (via audio conference), with support from Dr. Vijay Paranjape and Dr. Sheetal Menon from Sathguru Management Consultants, visited Bangladesh Agricultural Research Institute (BARI) for conducting a four-day training on ‘Gene Equivalency and Maintaining Line Purity’. This training module was designed to expose participants on the importance of quality seed production of Bt eggplant varieties for supplying to farmers. Gene Equivalency and Maintaining Line Purity trainees. Twelve participants including scientific and technical staff, members from plant breeding and seed production from BARI, and officials from Bangladesh Agricultural Development Corporation (BADC) were invited for hands-on training on advanced molecular techniques like PCR (for DNA-based detection) and Quantitative ELISA (for protein-based detection and quantification) for establishing gene equivalency for EE-1 event and maintaining line purity of Bt eggplant varieties released for seed distribution. The modules included experimental techniques and procedures for quantitative ELISA, event-specific PCR and zygosity PCR. Activities included sample preparation using DNA and protein extraction methods, electrophoresis gel preparation and sample loading, sample processing and interpretation of results. A session on ‘Maintaining Line Purity’ was conducted via audio conferencing by Dr. Smitha Kurup, Mahyco, to discuss the importance of stewardship during breeding phase. The closing ceremony was graced by Dr. Abul Kalam Azad, Director General, BARI, along with Dr. Dil Afroza, Head of Biotechnology Division, BARI, and Dr. Vijay Paranjape, FtFBP Stewardship Coordinator for Bangladesh. In extending his appreciation for the training, Dr. Azad said that scientists of BARI, and BADC would benefit from such hands-on initiatives to maintain quality at each stage of the product’s life cycle. This would go a long way in ensuring that farmers are distributed quality seeds of Bt eggplant, added Dr. Azad. Dr. Vijay further explained, “The training at BARI is being organized to achieve the larger goal of ensuring long-term sustainability of the technology and maintain longevity of the product. We are hopeful that participants understand the importance of these techniques for testing presence of event and its expression in the seeds used for distribution”. 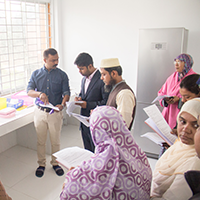 Collective efforts of Dr. Jahangir Hossain, Country Coordinator of FtFBP and Dr. Dil Afroza, Head of Biotechnology Division, BARI, led to successful fruition and implementation of the training sessions, with representation from relevant stakeholders involved in the Bt eggplant project. Dr. Pankaj from Mahyco encouraged participants to apply these techniques to regularly testing seeds for the presence of the event and quantification of protein expression in the end product. The major takeaway for the participants was the need to imbibe the culture of stewardship at every stage of the product life cycle for ensuring long term sustainability of Bt eggplant in Bangladesh.